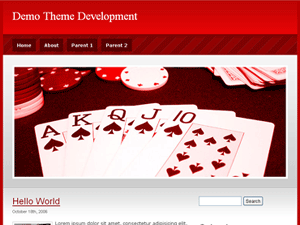 Description: A 2-column to 3-column hybrid theme with four widget-ready sidebars. Tell me. Have you ever seen FOUR widgetized sidebars? Rarely? No? That’s what I thought! Having more sidebars doesn’t mean it’s superior to other themes, but it sure looks cool! For this Poker theme, I modified another one of my private themes and turned it into a 2 column to 3 column widgetized hybrid.